If Rangers lose the third Old Firm game of the season, they would slip 13 points behind Celtic with seven games to go. Win, and the Scottish Premiership title race might still have some distance left to run. The Glasgow clubs have one derby win apiece so far this season. After being knocked out of the Scottish Cup by Aberdeen, Steven Gerrard will be desperate to not only prove the Ibrox side's season isn't about to fizzle out, but that he is the man to bridge the gap between Rangers and their city rivals. What can Rangers learn from the past two meetings? Look at the two Old Firm games already this season. 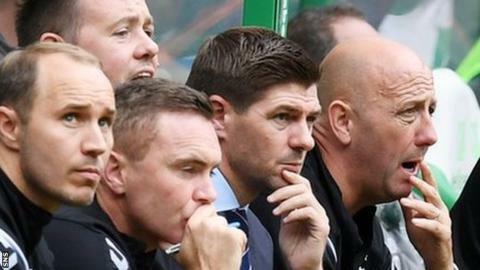 Both were 1-0 - the first was a comfortable win for Celtic and the second a comfortable win for Rangers. In fact, in both games, the winning team could have scored a couple more, so it's been quite level this season in that respect. Obviously, home advantage has played a big part in both results. But when you listened to Steven Gerrard after the first game, he wasn't too happy with Rangers' first-half performance in particular. They never laid a glove on Celtic and he learned from that. Going into the game at Ibrox, his team was outstanding and it was their performance of the season and should have been two or three. Yes, Celtic weren't at it, but that was down to how Rangers went about their business. They definitely learned from that first game and that is the message that he'll be reinforcing on Sunday. Who might be their match-winners? Alfredo Morelos is having an outstanding season. He's not managed to score against Celtic yet and I know that's something that eats away at him, but it wouldn't surprise me to see that change at the weekend. His rate of goalscoring has been outstanding and he produces them on his own. I've been singing Ryan Kent's praises this term and he's been one of the outstanding players from Rangers' new additions this season. It maybe took him three, four or five games to settle in but since then he's been outstanding. He has been a real threat any time he's played. But, for me, Allan McGregor has probably been the best signing that has been made this season. It's hard to say that when you're talking about a goalkeeper, but if you look at the points he has earned Rangers through the saves he has made, it's not a contest for me. They've got big players, they've got good players. Scott Arfield has been a decent enough addition as well. Many Rangers fans would say the last Old Firm game was one of his better games. They're a good team. What about the Lennon effect? It's an Old Firm game and Neil has been through enough of them as a player and a manager, so there's no way he'll allow complacency to creep in to his team. You can see with the celebrations after they beat us at Dundee with a late goal at Dens Park a couple of weeks ago what it means to him. Some say it was over the top, and others say it shows what it means to him. So there's no way he would allow his team to approach the Old Firm game with any kind of lull or not knowing what's at stake. The Celtic players have been through it and they've tasted success over the last few years. For Rangers to try to prolong this title challenge it probably has to be three points.